It presents an extensive surface of dunes formed by dunes that are located to the North center; to the Southeast are the Galeras del Cinaruco, which are rocky elevations with an extension of 95 km.2, covered with vegetation, surrounded by grasses and inherited from the rock formations of the Guayanés Massif, are rocky elevations covered with vegetation, surrounded by grass and gallery forests that reach up to 250 meters high and show a great contrast in the middle of the low and flat savannas of the region. These unusual mountains have an area of ​​95 km2. The existence of morichales, gallery forests, pipes, lagoons, rivers that make up islands and extensive sandy bars, constitute a diversity of landscapes Llaneros that highlight the importance of the park as a reserve area and protection of complex ecosystems. Warm rainy. The inclement weather has two phases, the rainy season between April and November and from December to March an exaggerated summer drought where only the powerful of each species survive. 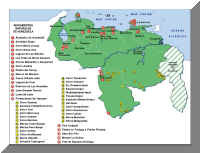 It presents an extensive surface of dunes formed by dunes that are located to the North center; to the Southeast are the Galeras del Cinaruco, which are rocky elevations with an extension of 95 km.2, covered with vegetation, surrounded by grasses and inherited from the rock formations of the Guayanés Massif, are rocky elevations covered with vegetation, surrounded by grass and gallery forests, which reach up to 250 meters high and show a great contrast in the middle of the low and flat savannas of the region. These unusual mountains have an area of ​​95 km2. The existence of morichales, gallery forests, pipes, lagoons, rivers that make up islands and extensive sandy bars, constitute a diversity of landscapes Llaneros that highlight the importance of the park as a reserve area and protection of complex ecosystems. The vegetation shows a diversity of forests and open savannas, which are submerged and not waterlogged; rivers and streams grow semideciduous riparian forests, seasonally flooded riverside forests, highlighting the gallery forests, which grow along the banks of rivers such as the Orinoco, Capanaparo and Cinaruco, presenting flooding areas almost all year round. 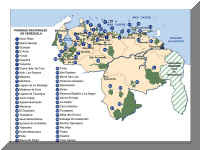 Las Galeras del Cinaruco is home to 57 plant species, which are not common inhabitants of the Venezuelan plains. The flora is rich in grasses, cyperaceae, legumes and rubiaceae. The morichales, on the other hand, are formed in the tributaries of calmer waters of the aforementioned rivers. The species that characterizes these morichales is the moriche palm Mauritia minor, symbol of the plain. In the savannas, in the lower basins of Santos Luzardo, Gramineae predominate, such as the straw arrow Trachipogum sp and Paspalum sp, and some tree species such as the cork oak Bowdichia virgiloides and the chaparro Curatella sp. In the flora there are 10 endemic species among which are Alibertia davidsei, Erythroxylon foetidum and Strychnos davidsei. The fauna of the park is characterized by the presence of a great variety of species, inhabited by 26% of mammals, 16% of birds and 35% of the known fish in Venezuela; among which three hundred and forty-five fish species stand out, such as the Cichla ocellaris peacock, the Colossoma macropomun cachama, the Prochilodus mariae coporo, the Electrophorus electricus shark and the rayao catfish Pseudoplatystoma fasciatum and P. trigrinum. Many of the terrestrial and aquatic mammals require special protection because they are in danger of extinction, such as the palmetto bear Myrmercophaga tridactyla, the leopardus pardalis, the puma Felis concolor, the jaguar Panthera onca, the manatee Trichechus manatus, the caramerudo deer Odocoileus virginianus, the chigüire Hydrochaeris hydrochaeris, the water dog Pteronura brasiliensis and the tonina Inia geoffrensis; the savanna cachicamo Dasypus sabanicola endemic species of the park. Among the reptile species include the lizard Nemidoforus gramivagus, the crocodile of the Orinoco Crocodylus intermedius, the turtle of the Orinoco or arrau Podocnemis expansa and the water snake or anaconda Eunectes murinus, endangered species, the baba Caiman crocodilus, the terecay Podocnemis unifilus, the babo morichalero Paleosuchus palpebrosus, the black babo Paleosuchus trigonatus and the llane frog Pseudopalodicula llanera. The park houses three species of endemic birds and more than twenty migratory birds. Among the latter, the Osprey Pandion haliaetus stands out. In addition to herons, grebes and storks among which is the imposing garzón soldier Jabiru mycteria. The Santos Luzardo National Park (Capanaparo-Cinaruco) is located in the western low plains, in the jurisdiction of the Achaguas and Pedro Camejo municipalities of the Apure State and Cedeño of the Bolívar State. By road following the San Fernando de Apure road to Puerto Páez. By fluvial way over the Capanaparo, Cinaruco and Orinoco rivers. 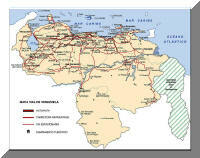 By air to the airport of San Fernando de Apure. Bring repellents and mosquito nets. Respect the environment Do not disturb the wildlife. Do not throw or leave abandoned solid waste or waste. Abide by the suggestions of the authorities of Inparques. It is required to request permission from Inparques to enter, camp, investigate, film and take photographs for commercial purposes in the park.